In this new GL-12 exercise video, I reveal how to lift your way lean and strong in a quick but powerful workout progression for your shoulders. I also cover key mistakes to avoid to prevent back injuries as well as tips and recommendations to get the best possible results from your workout. Hey everybody, welcome to part five of our new Dumbbell Workouts for Rapid Fat Loss series. 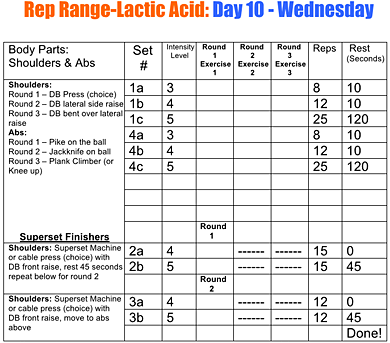 OK, everybody, so in this video, this is your second Rep-Range Lactic Acid workout for weeks 1 and 2. And in this video, we’re going to target your shoulder muscles. Make sure to print out your workout log sheet and follow along as you perform each of the RRLA exercises. So I have my wonderful wife Karen and Ryan here. We’ve picked the three exercises we’re going to do for different rep ranges: the Dumbbell Shoulder Press, the Dumbbell Lateral Raise, and the Dumbbell Front Row. The reason for this exercise selection is strategic. The shoulder muscles have three different heads. We have the front deltoid. We have the middle delt. And we have the rear delt. Karen is going to be working mostly the rear delt and a small amount of traps doing the press. Ryan doing the dumbbell bent-over row is going to be working the rear delt. And me personally doing the dumbbell front raise, I’ll be working the front deltoid. We’re going to start out with a heavier set of 8 to maximize muscle tension, moving immediately to a set of 12, and then a final set of 25 to stimulate more Growth Hormone (GH) for rapid fat loss. So the first exercise is a dumbbell press that Karen’s going to do, so a shoulder press in other words. Make sure that you have your weights in front of you ready to go for all three sets. Proper Form to Avoid Injury: A couple things to keep in mind for this particular exercise is when you come down, you want a 90-degree angle — you don’t want to go too deep. You want to come down to about the ears and straight back up again. You want to exhale up and inhale down. Tip: Keep your knuckles toward the ceiling as much as possible so that your wrists are straight. This will keep your forearm and triceps out of the movement and isolate the shoulder more. Maintain a slower tempo on the first set. On the second set, focus on doing about a medium pace tempo where you’re coming down for a count of 3 or 4 and exploding up for a count of 1 or 2. So now, about halfway through this, obviously, the muscle is going to start to burn. After finishing the set of 12, go ahead and knock out that last 25 with a little bit faster tempo and get that GH really cranking as you stimulate more lactate. As I mentioned earlier, the first mistake a lot of people make on this shoulder exercise is going beyond 90 degrees when bringing the weights down. Another mistake that people make when they do this particular exercise is these knuckle sometimes will turn back on them. When you do that, you engage your forearm and your triceps. We want to get those knuckles towards the ceiling. Proper Form to Avoid Injury: As far as ideal form, notice Karen has a slight arch in her back. And she’s keeping her shoulders nice and tight. She’s nice and stable. You can also do these dumbbell presses standing up. Just keep in mind you’re going to put a little bit more pressure on your back. Although you will work more of your core this way, you will have a little bit more pressure in your back as well. So you might have to adjust your weights. After a 2-minute rest period, we’ll move into dumbbell bent-over lat raises, an exercise that targets the rear deltoid muscles. Tip: A very helpful tip here is to imagine dragging your knuckles across the floor before you bring the dumbbells up. This is really going to help you isolate that rear delt so that you’re not using too much of your forearms. Tip: Another thing to remember is that lifting the weight doesn’t produce all the results. Lifting and lowering the weight produces the results. In fact, the lowering portion of the movement actually produces more stimulation than the lifting portion of the movement. So you shouldn’t really think about just lifting weights to change the way your body looks. It’s lifting and lowering. There’s two parts to the equation. Ok, so after your first set of 8 and second set of 12, move on to the final set of 25. This is where you will really start to feel it, and it’s also where your body will start releasing the hormones that can help you burn belly fat, even though you’re working your shoulders. So this an awesome bonus side effect of the dumbbell workouts for rapid fat loss. After another 2-minute rest period it’s on to the final exercise for your shoulders. For the dumbbell front raise, which is going to work the front deltoid, I’m simply going to raise the weight up to the front about eye level and fight it on the way back. That’s it. Make sure to maintain about a shoulder-width stance for this one. Tip: One recommendation with these is to make sure you turn your elbows up towards the ceiling a little bit, because that will help isolate the shoulder muscles more. Proper Form to Avoid Injury: You’ll want slightly bent knees as well as a slight arch in your back for this exercise, and make sure to keep your chin up. Exhale up to your eyes or a little bit above your eyes and come back down nice and slow, because remember, we want maximum muscle tension in the first set of 8. Tip: Again, imagine dragging those knuckles across the floor as much as you can and fight it on the way back. After your first set of eight, immediately sit the weight down and move right to the next set of 12. As you start to fatigue, intentionally force those knuckles up to the ceiling even harder just to isolate the front delt a little bit more. Also make sure to try to stay nice and straight the entire time. Now, if the weight gets a little too heavy, and you start to swing a little bit, that’s OK. Just don’t risk injury. It’s OK to strategically cheat the right way to get the right reps.
For the last set of 25, pick up the tempo a little bit, because you want to complete the set in order to stimulate more lactic acid. And we’re going for the burn now, not tension. Congrats for making it through this workout for your shoulders — it’s not for the feint of heart, but it’s designed to get you maximum results for your effort. We’ll be back with the next video to introduce you to abdominals.